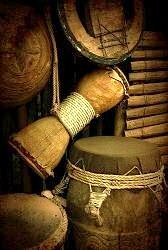 Through Your Favorite African Instruments! You know what I love about African musical instruments? They allow us to learn about this continent's culture by participating in it! Wether you are a professional musician or a complete novice - I'm sure there's an instrument you'll enjoy to play. Click here to find a large selection of African instruments available for purchase online. The continent's most famous musical instrument of all! All over the world, people have fallen in love with this drum. Here's everything you need to know as a beginner. Countless drums that nobody knows of deserve more attention. If the djembe-hype bores you, here is something new! The xylophone is one of the continent's most prominent instruments. Each tribe that plays it has it's own distinct xylophone tradition. Thumb pianos are deeply rooted in African culture and appear throughout the continent with a variety of names and features. Shakers and rattles can be found in every country in some form or another. The Axatse of the Ewe tribe in Ghana and Togo is just one example. Bells have many purposes. One of them is to provide the timeline in traditional music ensembles, as the Gankogui of the Ewe tribe shows. Yes, there's more to African music than just percussion. This continent is also full of melody created by flutes and fiddles, harps, lutes and whistles.